Some might say he was preaching to the choir last night. Jay Walljasper remarked on it himself as he opened his presentation at The Grand for the NDDC’s Partnership Celebration. In fact, he said he was working with folks in Brainerd recently and he asked them what they wanted their downtown to be like when they had completed their project and they said “Northfield or Stillwater”. He noted that they are both successful, but slightly different, models of great downtowns. Indeed, Walljasper emphasized the importance of many things that the NDDC has been talking about for almost ten years. He talked about Fostering Community and Assuring Safety, and we hold Monthly Forums and Block Head Gatherings, regularly focusing on “Quality of Life Issues”. 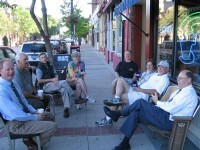 He praised Places to Hang Out and Nurturing Pleasure and Pizazz, and we work for Sidewalk Dining and Downtown Events. He advocated for Taming Traffic and Keeping Things Clean and Green and we’ve argue for safe crossings of Division Street and Dahomey Avenue and an Annual Spring Cleaning Downtown. Finally, he emphasized Boosting Local Economic Vitality and we champion Reduced Commercial Property Taxes and Shopping Locally. Jay also spoke for benches, bike racks (yes, bike racks), public restrooms, allowing sidewalks sales and sidewalk dining, and overturning regulations that hinder economic vitality. The NDDC’s old Action Squad formally presented many of these ideas to the City Council and Staff back in 2003. Most of these ideas are now being slowly but steadily realized. It was clear from his remarks that changes for the better take time, often more time than seems necessary. 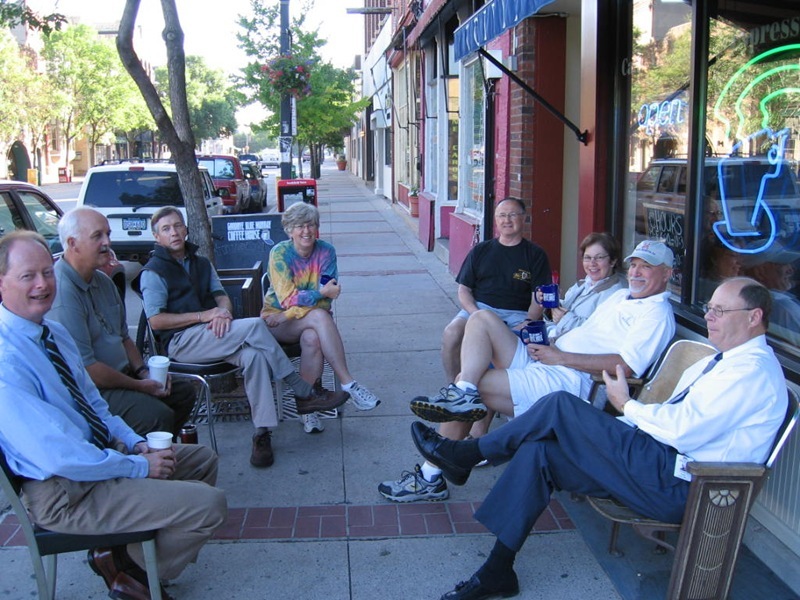 From Jay’s perspective, the most important ingredient for change is Social Capital, the citizens who are dedicated to making their communities great places. He gestured to the group and pointed out that it was obvious that we are rich in that kind of capital in downtown Northfield. With on-going attention, unflagging determination, lots of hard work, and an occasional enthusiastic celebration, our progress will continue. Thanks to Jay for his fine presentation and thanks to all the “social capital”, the folks who partner with us for the success of the NDDC, Downtown, and Northfield. Photograph courtesy of Griff Wigley. See more about last night on Locally Grown.